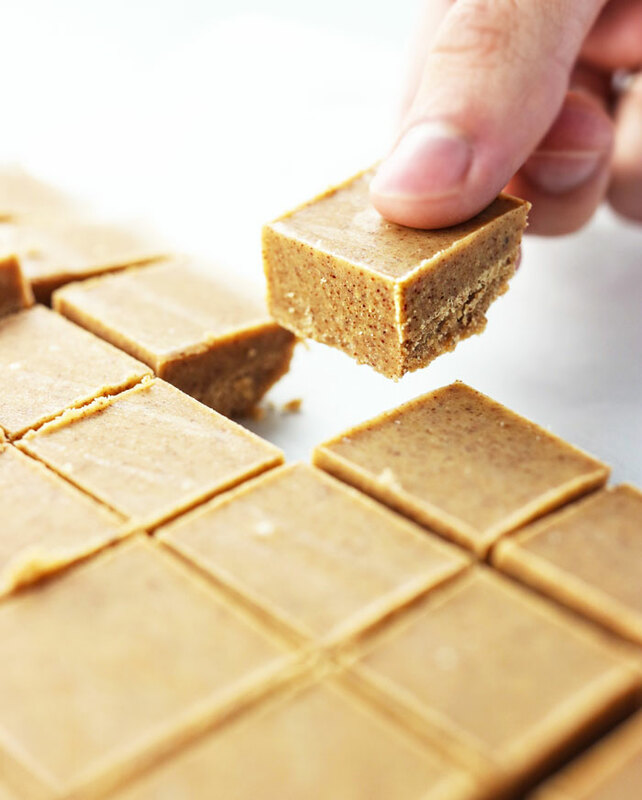 This almond butter fudge is a fast no-bake dessert that’s naturally sweetened with a touch of honey. It has an incredibly buttery flavor… without using a drop of actual butter. It’s a healthy dessert you can feel good about indulging in! The secret to this addictive fudge is the addition of coconut oil and sea salt. Please, don’t be tempted to omit these very important ingredients. 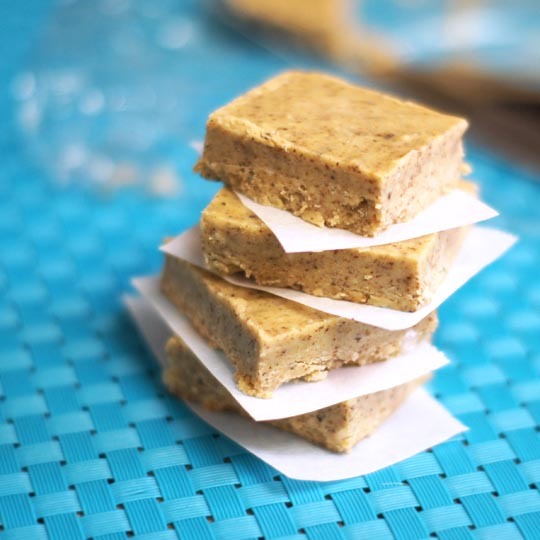 The coconut oil is what makes this fudge hold together, and gives it a firm, yet creamy, texture, while the salt adds a pop of flavor that perfectly balances out the sweetness of the honey. 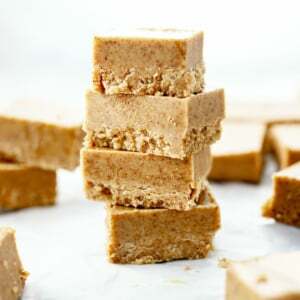 What I also love about this freezer fudge is that it comes together in just minutes. 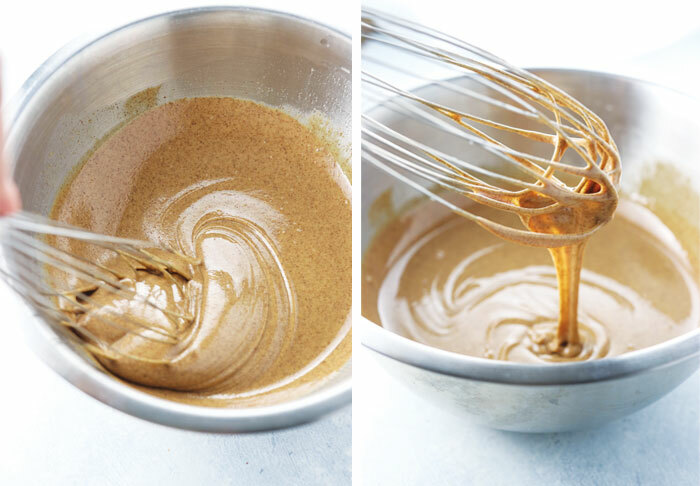 Stir together 4 ingredients, pour the batter into a pan, and freeze! The only problem with this fudge is that it won’t last long at room temperature. It’s one of those treats that melts in your mouth AND in your hand. That’s not much of a problem for me, as it tends to go directly from the freezer to my mouth, but it’s definitely not the type of fudge you want to bring to a potluck. It’s a stay-at-home freezer treat. Customize-able– use any nut or seed butter you like! 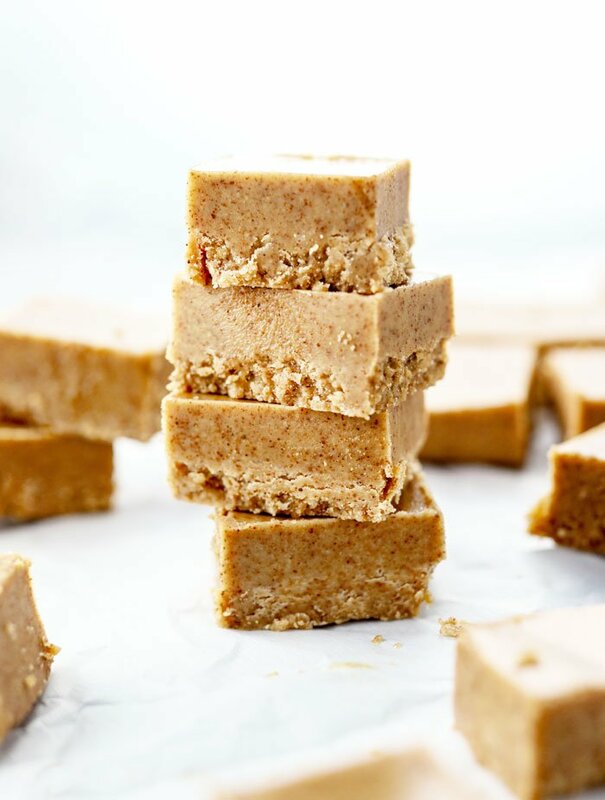 This creamy, almond butter-based fudge is raw, naturally sweetened with a touch of honey, and has an incredibly buttery flavor! Transfer the mixture to a square baking dish, lined with plastic wrap, then smooth with a spatula, and freeze until solid, about an hour. 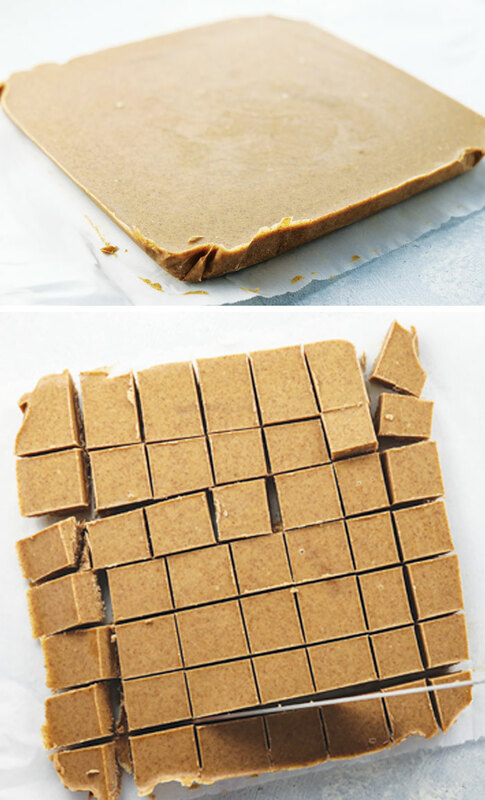 Remove the fudge by lifting the plastic wrap out of the pan, then cut into squares. Return the fudge squares to a sealed container, and store in the freezer until ready to eat! Please, don't be tempted to reduce the amount of coconut oil in this recipe-- it's what makes this fudge hold together! Also, be sure to serve chilled, as the fudge will melt if left at room temperature for too long. To make this recipe vegan, use maple syrup instead of honey. I find that honey is sweeter than maple syrup, so you might want to add an extra tablespoon or so. Luckily, you can taste as you go until it’s just right! Reader Feedback: What’s your favorite non-chocolate dessert? I made this for my mother in law who can’t have dairy or gluten. SO good! Thanks, Megan! Is it ok to use almond flour to make almond butter? Thank you. I’ve never tried that, so I can’t say for sure. I’d assume it would work, but the only way to know is to try it out! Please let us know if it works for you. i wish i could give this 1000 stars!! when i first read the recipe i thought “ok…what’s so special about that?” but i gave it a try and I AM SO GLAD I DID. this is seriously one of the most amazing things i’ve ever tasted. the sea salt in this recipe is what does it for me. creamy, lightly sweet, salty, a touch coconut-y. holy moly i’m in heaven. OMG! Made som,e almond butter per your instructions on another post and then made this raw fudge. Soooo good. In fact, I love it before it was frozen and would make a great spread. Thanks so much! I love mint chocolate and orange chocolate so I add organic 2 tablespoons of cocoa powder and a few drops of orange oil/peppermint oil to these. They are amazing!!!! This recipe is awesome!!!! This is the first recipe of yours that I tried and I will be trying many more. I am so happy that my daughter sent me your website because most of the ingredients you use in your recipes I can have. I am an oncology patient and I am not allowed any sugar or white flour. Thank you so much for this recipe and many others that you have posted. This recipe looks so amazing and I cannot wait to try it!! I have a question though. I did not know there was salted and unsalted almond butters. Where would that be displayed on the jar? I thought it was just almond butter or… Not almond butter… I guess I was wrong.. 5 stars for geniusness!! Meant to give this 5 stars :). I just made these, they are freezing now! Licking the bowl was fantastic, can’t wait to eat the actual fudge! Could you use date paste in this recipe for sweetness instead of honey/stevia? Tried these a week ago and my 10 year old daughter and I are ADDICTED! We added a bit more salt and honey and put the mixture into candy molds. Pops right out of the molds into our mouths wayyyyy too easily! Loved seeing the others’ ideas, especially the one using maple butter. I added some extra salt, a few shakes of cinnamon, probably about 1/4 cup of cocoa, and a capful of vanilla. And about 15 drops of Now Better Stevia. Turned out great. The salt rounds it out. And no sugar! I don’t have almond butter 🙁 can I use Hazelnut instead do you think? It will change the flavor, so you may need to adjust the rest of the ingredients, but I’m sure a hazelnut fudge would be tasty, too! New follower and can’t wait to try this! On day 3 of a sugar reduction/detox. I am ready to eat. I love almonds and I am always looking for a healthy treat when I want something sweet. These are in the freezer right now 😀 I just made them! WOW! Someone linked your Peanut Butter and Banana ice cream on Facebook and I couldn’t help but browse around. This recipe is great and I whipped it up during the finale of the bachelor tonight. Sooo good! I shouldn’t have made it though – I keep getting up to get another piece! Great recipe, thank you for sharing! How can I make this into a one serving portion? As you would any other recipe, simply divide all of the ingredients down into the serving size you’d like. Just made a batch for a vegan friends bday! This was amazing! I’m making a second batch now! TO DIE FOR! Wow. It is so so smooth…it’s silky. Everyone has loved it who has tried it. Perfection. Did you just make this up? Brilliant. Keep the recipes comin’, Megan! I want to try them all! I have been sugar free almost a year and am now addicted to this fudge!! I replace the honey with rice malt syrup. I love knowing I have a stash in the freezer…….thank you. I was pretty devastated when I realized I needed to do a cleanse and be off sugar for two months. Even though I have been doing a good job, you have boosted my morale! Thanks so much! I am so excited to try this. Looks so incredibly simple but delicious!!! I am salivating already. fabulous! i used my raw almonds and pulverized in the vitamix then added the other ingredients including honey and some cocoa nibs. a hit in my household! this recipe is a keeper. i may try this basic one and add some cocoa powder next time and see what happens. thanks! I was wondering how long these are good for outside of the freezer? They look delicious! Thanks! It depends on the temperature of your room. I wouldn’t expect them to stay solid for longer than 30 minutes out of the freezer. These were perfect! I didn’t have raw almond butter, but used organic from Trader Joe’s – they came out amazing! Recently discovered your blog and absolutely love it!! Thanks for sharing all the great recipes! I really loved this recipe but it was way too salty for my taste. I had to double the recipe to make the salt tolerable. I do love salt and add it to everything, however in my opinion this recipe could use half the amount. Thanks. I added raw cacao nibs, yummmm. Thanks lovely! I will have to try find some sunflower seed butter! Just made this tonight and it is AMAZING! Thanks for sharing. This looks amazing! I’m allergic to nuts, seeds and coconut are fine, however I can’t have almonds or any other nuts. Do you have an alternative I could use?